Among the many fascinating reveals in the opening keynote of the Microsoft Build 2015 developer conference—Android and iOS code running on Windows phones,holograms that can attach themselves to physical robots, and Visual Studio for Mac and Linux—was the Microsoft Edge browser. Extensions are hardly a new capability in Web browsers, and even Internet Explorer had some extensibility, with toolbars, WebSlices, and Accelerators. But Edge brings the promise of full Firefox- and Chrome-style extensions. An important note about extensions in Edge is that the feature won’t ship with Windows 10 RTM (release to manufacturing) this summer, but will come in a later update. Windows 10’s voice assistant seems to be popping up everywhere, and Edge is no exception in this regard. When you land on a page for which directions make sense—say you’re on a restaurant’s webpage—Cortana pops up with her familiar blue circle in the browser toolbar proposing relevant information. You can also right-click on selected text to have Cortana find info about the selection. People hit that bar atop the browser to open a new tab over a billion times a day, and Microsoft wants to make good use of that real estate. IE’s new-tab page was actually one of the more useful among the browsers, all of which let you search and see thumbnails of your most-visited sites, but also let you re-open closed tabs and see site suggestions. In Edge, the new-tab page still shows top sites, but also app suggestions, weather, sports scores, and video suggestions. Interestingly, the page doesn’t show an address bar, but you can type a URL into its search box. Another feature that’s been available in other browsers for years (particularly in Apple’s Safari) but is making its debut in Microsoft’s new browser is Reading Mode. This lets you strip out all the extra junk on a webpage aside from the main text and images —ads, sidebars, and so on—so you can read undistracted. Very useful for magazine like sites—like PCMag.com! This one has not appeared on competing browsers from Mozilla, Google, and Apple, though I’ve seen a similar feature in the lesser-known Maxthon browser. Edge lets you mark up webpages with a highlighter or drawing tool and then share them as an image file in email or social apps. Microsoft’s new browser shows promise, and seems to be moving in all the right directions—faster speed, more standard support, extensions, and even a couple of unique features like page markup and Cortana integration. The fact that it will deliver the same experience on every device size—from Raspberry Pi to HoloLens to Xbox One—is another advantage. To try it out (on a non-critical PC), you can join the Windows Insider program and install Windows 10. Walden University is a regionally accredited online university. Learn more about Walden here. The Manager of Reference Services reports to the Director of Library Services and is responsible for developing and implementing policies, procedures, and training for the Walden Library Reference service and Quick Answers service. This position works closely with the Director of Library Services and the Library management team to align the reference service’s mission, strategies, and goals with those of the Center for Student Success and the University. We plan and prepare for the future, but trouble has the unsettling quality of popping up when you least expect it. However, it’s in those moments of sudden chaos that God is moving and working out His plan. Bishop T.D. Jakes delves into the account of Mary, mother of Jesus, to elaborate on how God’s plan will override ours for His glory. Directed by Bishop T.D. Jakes. You may not know Toya Graham’s name, but you might remember her pulling her son out of the Baltimore riots on Monday. The proud mother of six talked to reporters on Tuesday about the viral moment. While everyone applauded Graham by naming her “Mother of the Year,” Graham says she didn’t want her only son to be another victim of police violence. The mother was seen hitting and grabbing her son after spotting him in the middle of the riots following the funeral of Freddie Gray. She also says she didn’t notice the cameras were rolling when she yanked him from the chaos. Out of the 235 arrests made overnight on Monday, 35 were juveniles. 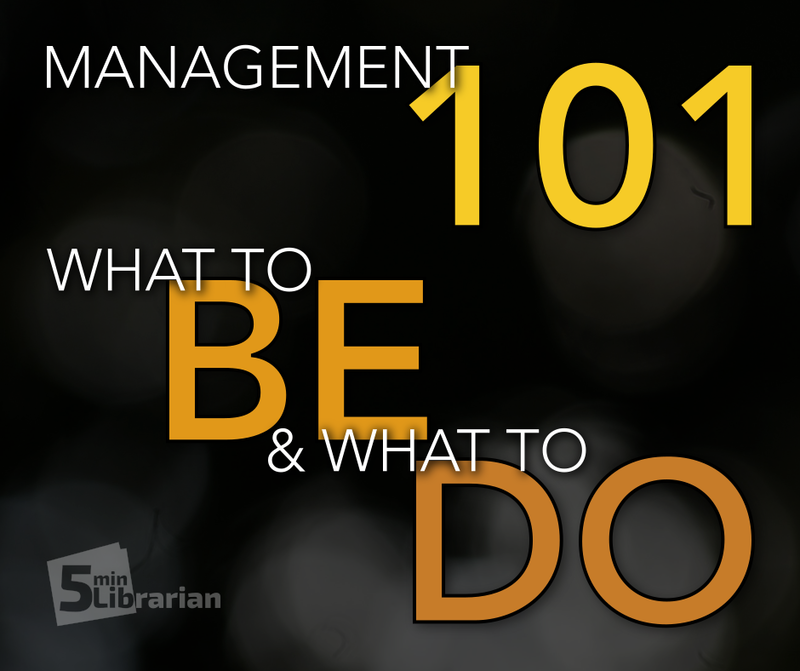 Back in October, there was a fabulous conversation on ALA Think Tank about what is Management 101. So many people participated that the comments filled up eleven pages! I enlisted my Director (thanks, Margaret!) to help me pull out the best of the best and trimmed it down to a two part series. Be a leader, not a manager. Be professional, consistent and kind. Be really aware of the power differential – people respond differently to you when you are their boss than they did when you were their peer. If you really want open dialog, you have to create an environment where people feel safe expressing their thoughts. Be willing to own up to your own mistakes and shortcomings. Be an active listener. Don’t rush to judgement. Be willing to change your mind and make sure that your staff understands that it’s okay to change your mind. Be compassionate – to everyone. Be fair and back up your staff. Be optimistic, be positive – but also be alert to the possibility that you’ll be inheriting a couple long-standing, under-addressed problems that you’ll be responsible for fixing. Be honest, transparent, and consistent. Have integrity and start with yourself. Be the example. St. Catherine University, St. Paul campus, invites applications for a fulltime Head of Library Collection Services to provide leadership and vision for the libraries’ Collection Services Department, including collection development, cataloging, acquisitions, and serials. The successful candidate will re-envision traditional technical services functions to enable the department to move forward in a complex environment of evolving collections, systems, and technologies. This work requires a keen understanding of the daily demands of the department as well as an enthusiasm for integrating its services into the libraries’ learner-centered environment. View the full job posting for responsibilities, required qualifications, and to apply. THE University of the West Indies (UWI), Mona, planted its first legal ganja (marijuana) plant yesterday, symbolising its position as the pioneer in legally cultivating and researching the benefits of the drug in Jamaica. Emotive adjectives coloured the presentations from government and university officials at the function marking the event, at the Agora Gardens, Faculty of Medical Sciences Teaching and Research Complex. Minister of Science, Technology, Energy, and Mining Phillip Paulwell suggested that it was “a wonderful day”, while UWI principal, Professor Archibald McDonald, pronounced it a “historic and amazing day”. “If we can play our cards right, good things can happen for the people of Jamaica,” Minister of Justice, Senator Mark Golding, who piloted the Bill in the Senate decriminalising the drug, commented. Under the provisions of a ministerial order issued by Paulwell recently, under the Dangerous Drugs Act, the UWI, Mona, as well as the University of Technology, Jamaica (UTech) are now licensed to grow ganja for research purposes. Yesterday’s event was to witness the planting of the first legal ganja plant on the UWI campus. Paulwell explained that he issued the order under Section 7 (d) of the Dangerous Drugs (Amendment) Act, which was passed by Parliament in February. He said that the order was “absolutely critical” if Jamaica is to be cited as the place for medicinal research and development of the product. “We now have an opportunity to catch up (and) I want Jamaica to be the centre of excellence for research in medicinal ganja,” Paulwell said. He stated that the order will also allow the university to contract farming of the weed outside of the Mona campus, but suggested that, when that is done, the university should pay particular attention to the small farmers. He said that the law also allows him to grant authorisation to other bodies. However, he warned those interested in the commercial aspects of the drug to start by looking at their own research and development capabilities, and the opportunities being created at the university for research and development. Professor McDonald, noting that the UWI has recently assumed pole position among tertiary institutions in the Caribbean, thanked the Government and the parliament for making the ganja experiment possible. “Almost two years ago this was the most conservative institution in the Caribbean, and today here we are planting the first legal ganja plant after 102 years,” McDonald said. He said that ganja had been demonised for economic reasons, and alcohol and cigarettes were never so demonised because they originated in the northern countries. “Ganja originated from countries in the south, therefore, it was important that the interests of alcohol and cigarettes were protected,” he said. He said that the UWI will now do the necessary research aimed at providing the scientific basis to show that ganja is a medicine, and is effective against a range of diseases. Senator Golding, meanwhile, reiterated that the interest of the Rastafarian community would be protected. He said that there were three areas to protect their interest: (1) entitlement to certain lands designated for cultivation for sacramental purposes; (2) places of worship to be designated as such for the use of ganja as a sacrament; (3) and events primarily for observing the faith to be exempted from the Act. Golding also said that he will also be setting up an advisory group to give guidance on how the permits are to be issued. Thank you for all your great feedback! We updated our list to include even more great apps! Although this is the information age, one of the most common places for people to seek information is still the public library. Fortunately, modern libraries have kept up with technological advancements and have integrated computers, the internet, and other important tools as a normal part of this dynamic hub where paper media meets electronics. In fact, many people view the library as the central information center of the city, and in order to retain this title, librarians now find themselves faced with the need to utilize smartphones and tablet apps to complete their tasks and perform jobs more quickly and efficiently. There are various applications on the market for librarians, each with their own uses, and although not all are helpful in the library, you might be surprised to learn of how many do serve a literary purpose. 1. Kindle – The Kindle is by far the most globally popular e-reader and e-reading app on the market, and was created by Amazon. Due to its connections with Amazon it has a huge selection of books to choose from in a multitude of categories. 2. Nook – Similar to the Kindle, the Nook is featured by Barnes and Noble, and has many new releases for sale as well as a small selection of free reading materials. 3. Kobo – Kobo is an e-reader company that was established in Toronto, Canada, and is the second most used e-reader in the world after the Kindle. It’s most commonly used in Canada, and hosts a large assortment of books. 4. Free Books – The Free Books app provides 23,469 classic titles for your selection, and allows for highlighting, notes, dictionary support, and bookmarks, which make it an asset for any library. 5. iBooks – iBooks is an iTunes app that includes access to the iBookstore for a wide variety of reading materials. 6. Good Reader – The newest Good Reader application is called Good Reader 4 and it’s more of an academic tool than some of the other e-reading apps on this list. It allows you to access scholarly articles and other documents and save them to your mobile device for later viewing. 7. Bookviser – This application was specifically designed for Windows-based mobile devices and is used by over 700,000 Windows phone owners to browse and read their favorite books. 8. Audiobooks – Not everybody can enjoy a book on the go, or has the time to sit and scan a page; luckily, the Audiobooks application offers free books that you can listen to for multitasking and hands free enjoyment of books. 9. Readu – This application reads EPUB and TXT files and allows you to download books from other places and sites, as well as translate text. 10. Freda+ – Freda+ is a customizable reading application that allows for changes in font and color, and accepts text formats like EPUB, HTML, TXT, and FB2. 11. Box – Box provides secure access to cloud storage and collaborating on a multitude of mobile devices. 12. Outliner – This application assists with the organization and maintaining of the appropriate structure for projects and planning while at the library. 13. Pages – Create documents for many purposes including library newsletters, documents for handouts and other pages that may need to be printed later with this mobile word processor. 14. World Book: This Day In History – This app is perfect for posting a history fact of the day on a library webpage or in individual library departments. 15. iNapkin – iNapkin is an app for iOS devices and allows you to take notes, organize them and access them later. 16. CalenGoo – CalenGoo is made for mobile Android devices and can be used to sync Google calendar and other Google apps with your phone. 17. Evernote – This free note making app organizes and saves ideas by giving you the opportunity to snap photos, take notes, make voice reminders, and even scan business cards. 18. Things 2 – Things 2 is available for iPad, Mac, or iPhone, and manages tasks by planning your day, saving important dates, customizing workflow, and organizing e-mail. 19. LanSchool Teachers Assistant for iOS – This is a free classroom organization and management software that allows librarians to block certain content and monitor patrons in a digital loan setting. 20. History: Maps of World – This app is perfect for libraries to have on hand during presentations or children’s learning events where geography is being discussed. 21. Dropbox – Dropbox is a cloud app that allows you to share files between your tablet, mobile phone and computer wherever the app is installed. 22. Docs Anywhere – As the name suggests, this app allows librarians to take their Word and image documents anywhere. This is done through USB transfer and it works with Word, PowerPoint, Excel, PDF and other kinds of files. 23. Keynote – For librarians who make group presentations for management purposes or during patron events. Keynote supplies animated charts and many other features. 24. eClicker Presenter – Another presentation application, eClicker doesn’t just provide standard presentation guides and tools, it also gives librarians the ability to send out questions to the audience with the click of a button. 25. Moodboard – Moodboard is a way to put together all of the events and interests going on around the library into one neat display. Print your page and post it up in the library, or have it uploaded to the library website so that patrons can see what’s new and interesting. 26. Offline Pages Pro – Although most libraries have wi-fi, there isn’t always access on the journey between home and work. Offline Pages Pro will give you the opportunity to take information and webpages with you to read or work on while you’re not connected to the internet. It also includes PDF reader support. 27. Dictionary – Reading is no fun if you don’t know meaning of all the words that you are reading, which is why having a dictionary on the go is a great tool for a librarian. This app also works as a thesaurus and offers a word of the day for each day of the week to strengthen your vocabulary and keep things interesting. 28. Wikipanion – Wikipedia may not always be 100% guaranteed correct information, but it’s an excellent resource for librarians in a pinch who need to look up an answer to a question of a patron. It is one of the largest online information sources across the globe, so it has a little bit of everything, and Wikipanion was designed to easily access the information in Wikipedia. 29. Osfoora 2 – Twitter is a huge method of communication for many people globally, so tweeting to patrons from a library twitter account is a perfect way to keep in touch. Osfoora 2 lets you use more than one account at a time to send tweets for work. 30. Quickoffice – Quickoffice combines Word, Excel, and Powerpoint into a great mobile app for librarians who need to open, edit, and send documents on the go. This is wonderful for presentations, reports, and other paperwork that have to be processed from time to time. 31. Wolfram Alpha – This multi-functional application can help answer questions through a variety of educational tools for math, history, geography, and more. Different features of this app work with different subjects, which could help to better understand various subject matter within the library. 32. ReferenceUSA – This application is only available for iPad at the moment, but it’s a wonderful app for librarians who need real time access to research databases across North America. You must have a registered library card to use this app, which is highly convenient if you happen to work at a library. 33. ArticleSearch – This is a free app that, like ReferenceUSA, gives you access to a wide selection of scientific papers, academic journals, and other publications. It is great for research related to academic projects going on within the library, and it is also helpful as a library patron aid for those who come to do school work. 34. Farlex – Farlex provides a free and professional level dictionaries for librarians and other users who not only want to look up words and find their meanings, but also listen to their correct pronunciations. As a librarian there are always going to be kids and young adult readers who have questions concerning book titles and other difficult words throughout reading material, and this can really help. 35. Mango Mobile – The Mango Mobile Library Edition helps with language learning and is free for both iPhone and Android users. With this app you can take cultural lessons and hear the proper pronunciation of words by native speakers. This is a wonderful way for librarians to enjoy books with other languages featured throughout them, and also to share those books with children in reading programs and other events held at the library. 36. TurboScan – This application gives librarians an edge by allowing them to scan multiple documents using their mobile devices. This works well for receipts and business cards and also for other reading resources that you might like to store. 37. CamDictionary – CamDictionary lets you translate text into different languages and also provides the correct pronunciation. This app is particularly neat because you don’t need to type the word with text, but you simply point and click, and a photograph will be used to determine the meaning in other languages. 38. Google Goggles – This is an Android application that can be great for librarians who want to look up a certain person, place, or item, but can’t think of the name. You simply take a photo using your mobile device and then Google Goggles will search for it in its database and give you some information about it if it is found in its database. 39. Adobe Reader – This app works for most mobile devices and helps read pdf files without any of the trouble that some pdf readers cause. This is available for a large selection of handheld phones and tablets. 40. iAnnotate PDF – This is another pdf reader that gives librarians the added advantage of editing their pdf files from their mobile devices. 41. Offline Pages – For librarians working without access to the net, Offline Pages will store entire web pages so that you can look at them while out of the reach of wi-fi. This is a great way to store info on the go to look at while in transit, or even just when you need a quick glance at something, but don’t want to wait for the entire page to load online. 42. The Guardian Eyewitness – A very well-known European news source, The Guardian has developed this application to connect users with the world on a whole new level. Unlike other world news programs, this application is designed to bring you strikingly beautiful images from across the globe that visually reflect current events. There is an image of the day, as well as a themed archive of photos that can be sorted through. 43. CNN – CNN reports important, up to the minute headlines from around the world. From this application a librarian can stay in the loop of different global subjects and factual information that might be required for later projects and for personal knowledge. 44. NewsRack – NewsRack is an RSS reader for global news which include crucial top stories from many countries and can be used by librarians to stay informed on an abundance of subjects. This is a great way to connect with the news before work or to look up a top story for research purposes. 45. USA Today – For news affecting the United States, the USA Today app is available on nearly any handheld device or mobile unit. This news app also follows world news and includes subjects like money, sports, travel, life, tech, and weather. Each of these applications has some really great qualities to offer librarians at work or at home to stay organized, up-to-date, and, of course, do some reading. Although some apps might have similar attributes, each individual tool tends to have its own specific advantages to look forward to. If you can think of any other applications that might make life as a librarian more convenient, interesting, or fun, leave a comment. With so many rapid changes occurring in technology and social media, librarians need to maintain their role as technology leaders more than ever. That doesn’t necessarily mean that they need to be the first adopters of new tech, but in being early users of the most effective technologies. In order for librarians to help students learn how to analyze information, apply it in different contexts and pinpoint potential areas for growth, technology should engage and encourage students to construct and build knowledge rather than being an arbitrary, sporadic, or rarely used instruction tool. Some libraries require librarians to spend an allotted portion of their weekly schedule networking and posting events on social media sites, news portals and the like. Technology integration requires librarians to spend more time using tech to learn rather than spending time learning to use new tech. Logically, this is why it is advantageous to stick with the tools that are tried and true — the tools that are intuitive and useful — rather than to jump on each and every trendy bandwagon that comes along as technology shifts. Of course, it’s also important to keep an ear to the ground for evolving tech as well as newly popular tech, so librarians should reserve short blocks of time solely for the purpose of visiting their favorite online haunts and social networks to research and seek recommendations from experts, even if it’s off-the-clock. When a certain technology becomes widely-used by fellow contemporaries and institutions, it’s important to at least keep abreast and carry a basic understanding of its functionality and purpose, even if you decide not to implement it yourself. When a particular site or new technology becomes popular with the general public, it’s often beneficial for librarians to adapt and interact with users rather than underestimate or dismiss new trends. For instance, a librarian who actively uses sites like Pinterest or Facebook to post creative content with a focus on community has greater potential to reach a broader target audience than locally posting flyers or mailing printed newsletters. Determining which platforms will perform most effectively in the ever-changing and always-evolving world of digital technology is part premonition based on experience and part luck. The public won’t always flock to the most intelligible, intuitive, or advanced technologies available. Sometimes, great resources are entirely overlooked. Useful little start-up companies with great ideas can’t compete with the big dot coms and eventually fall by the wayside. Other times, masses of reference material and data exist within an entirely unnavigable site or under a poorly visible domain. Essentially, finding and utilizing technology in a way that facilitates collaboration and invites the community to participate may be just as important as technology designed simply to instruct or deliver information.